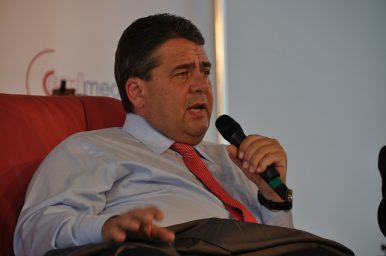 Reviving Europe’s unity was the theme of German Foreign Minister Sigmar Gabriel’s recent speech in Paris. The minister’s address at a gathering of French ambassadors was meant to remind Europeans of their joint purpose, but it ended up raising eyebrows in China, which was presented as a threat to European unity. The German minister appealed to EU members to pursue a joint foreign policy vis-à-vis the Asian power to counter Beijing’s tactics: “If we do not succeed for example in developing a single strategy towards China, then China will succeed in dividing Europe,” he said. The Chinese Foreign Ministry declared to be “shocked” by the statement. China has tried to draw Central and Eastern European countries into its orbit with the so-called “16+1” format. Created in 2012, this framework offers a special platform for Beijing to discuss political and economic issues with 16 states in Central and Eastern Europe without the intrusion of Western European nations. China has also been investing heavily in countries connected to its Belt and Road Initiative. Some of these countries have been less willing to criticize the People’s Republic than their Western European counterparts. This includes issues on which they had agreed to coordinate and pursue a common foreign policy in Lisbon in 2007, such as human rights and principles of international law. In a recent case, Greece – a key destination of Chinese investments under the Belt and Road Initiative – blocked a European Union statement at the UN Human Rights Council that was critical of China’s human rights record. Gabriel mentioned another example, when some member states last year prevented the EU from taking a strong stance on China’s refusal to accept an international court ruling on its territorial claims in the South China Sea. “Some EU member states don‘t want to approve [the ruling], because they do not want to put themselves in conflict with China,” Gabriel said in his address to the French ambassadors. In the clearest signal to Beijing (and to some EU member states), the German foreign minister demanded that China should follow a “One Europe” policy – just as European countries follow the “One China” policy, which accepts China’s dictum that foreign nations should not entertain diplomatic relations with Taiwan. While cross-Strait political consensus is not free from controversies (Taiwanese President Tsai Ing-Wen refused to reaffirm the One China principle in her inaugural speech in May 2016, for example), some in Europe may even agree with Cui’s characterization of the EU’s struggles to formulate common policies. But Beijing’s comments also appear to prove Gabriel’s point: that China is ambivalent about its support of EU integration and that it fails to acknowledge the legal and political principles underlying the need to form political consensus on foreign affairs among EU member states.